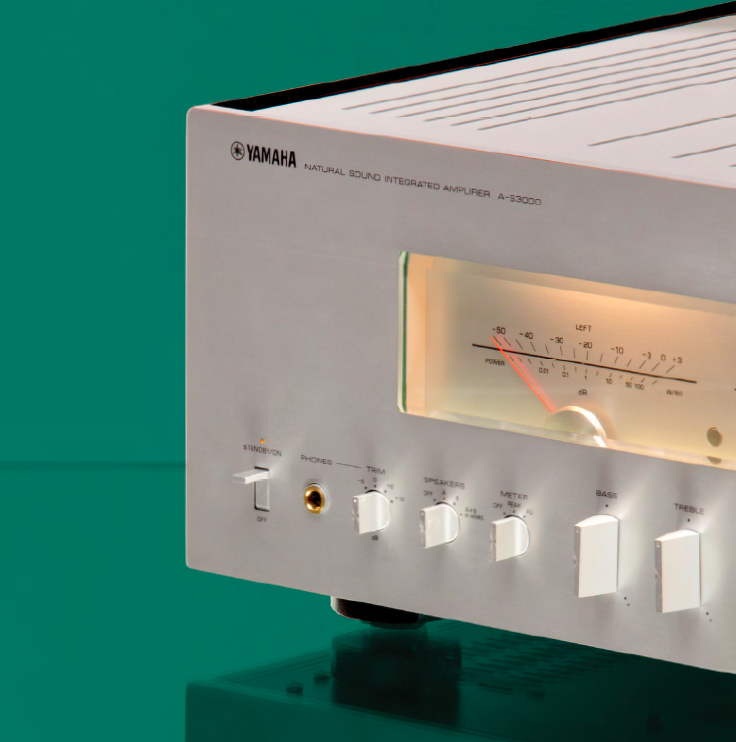 Back in the day, Yamaha components were always regarded as a cut or three above the usual imports from Japan such as Pioneer, Sansui, Kenwood, even Sony. They boasted solid build, superb engineering, very good (or better) sound, and often both technical and aesthetic innovation. Readers of my generation may remember the TC-800G cassette deck, with its cool front panel that sloped back about 45 degrees; the B-6 amplifier shaped like a pyramid; the NS-1000M speakers, reportedly the first to use beryllium tweeters; and the NS-10M studio minimonitor, a favorite of professionals in search of a high-accuracy small speaker (and which attracted a cult among audiophiles as loyal as that of the LS3/5a). In addition to seeming more serious about performance and sound, Yamaha also had an aura of being, well, classier than the competition. The layout of the controls was a model of ergonomic logic, while both knobs and buttons inspired confidence and were a tactile pleasure to operate—the word “silken” comes to mind. As I’ve already indicated, the aesthetics are redolent of classic styling from the old days, and this extends to function as well. The A-S3000 is part of a new breed of control electronics that run against the—to my mind, misguided—minimalism that has run rampant in high-end audio for at least the last thirty years. When Robert Harley asked me to review the A-S3000, he said, “You’ll love it, Paul, it’s got tone controls.” (One mark, among many, of a good editor is that he knows his writers, and RH certainly has my number here.) In addition to tone controls, the A-S3000 also has balance control, A/B speaker switching, headphone amplifier (with a novel trim feature that allows for a greater physical range of the volume pot), and a built-in phonostage for both mm and mc pickups. Functionally and ergonomically, this new integrated may be retro, but a great deal of very forward thinking has gone into the circuitry, the layout, and the physical construction. In terms of design, engineering, quality of parts, execution, and sophisticated thinking, the A-S3000 can withstand easy comparison to competing integrateds and separates costing multiples of its $6999 suggested retail price. The technical side and features complement of the A-S3000 are summarized in the sidebar, so let me get directly to the sound, where, I fear, I’m going to get into trouble once again in certain quarters when I report that the sound is exactly what you’d expect from any contemporary solid-state amplifier with pretensions to high-end status: transparent, low in noise and distortion, tonally neutral. But before you trip the trapdoor, give me a moment to say that I pressed the A-S3000 into service during the last three weeks of my evaluation of Harbeth’s Monitor 40.2 loudspeaker (see TAS 269), for which I was using a Pass Labs 10/X150.8 preamp/amp combination, graciously on loan from the manufacturer. I just swapped in the Yamaha—it was already well broken-in—and went on with the business of concluding my evaluation of the speakers, paying little or no attention to the amplifier as such. It’s not that I didn’t notice there were some differences—the Harbeths are extremely accurate—but these were of so low a magnitude as to cause no distraction from the immediate task at hand. Admittedly, I wasn’t concentrating on the amplification, but that is precisely my point: The Yamaha did nothing to draw attention to itself. With any competent or better contemporary solid-state electronics in what I would call the broad middle of the market, which is to say above the budget range and below the stratospherically priced gear, I find this to be far more the rule than the exception. Once I turned my attention to the A-S3000 itself, here’s what I can report: Its sonics are essentially neutral in the specific sense that it’s difficult to isolate tonal characteristics to which I can reliably attach adjectives. Yamaha’s designers make a big point about how solid-state MOSFET technology, of which this new amp is an example, tends to suggest the warmth of tubes. Well, I’ve rarely encountered a well-executed MOSFET circuit that I’ve found anything to complain about. But while the A-S3000 exhibits absolutely no untoward solid-state effects, I can’t say that for me it evokes the sound of tubes either. For one thing, unlike most tube amplification, no one is likely to find that the A-S3000 saturates tonal colors—“saturation” being a term of great approbation among tube fans—nor is it glowing or liquid or refulgent. Neither is it grayish, lean, thin, bright, mechanical, or electrical sounding. Rather, it’s notably clean, controlled, and composed. Is there a trace of the coolness that some people claim to have found in Yamahas back in the old days? Not that I can discern, but if your tastes lead you to judge any component that doesn’t sound positively warm as therefore cool, you might hear things differently. There may be an exceedingly mild hint of reserve and restraint, but I surely wouldn’t want to push that too hard. One review I read, of British origin, considered the amplifier smooth but unexciting, and another found it didn’t do rhythm engagingly enough, or whatever words to that effect are current among British reviewers—the all-purpose “pacey” still seems to be the favorite. I have a hard time getting my mind around judgments like that because reviewers who make them seem to me to be asking the component to contribute something to the source rather than reveal what is in it. This particular reviewer was specifically referring to the amp’s performance with rock music, wherein may consist the rub. Do audiophiles who love rock ‘n’ roll, heavy metal, rap, hip-hop, etc., prefer inaccurate reproduction? If that sounds too judgmental, let me substitute “interventionist.” I raise the question because there’s obviously no equivalent in reality to the sound one hears on rock recordings, and maybe the current widespread enthusiasm for tipped-up top ends, presence projections, lean upper-bass, and punchier midbass are perceived as compensating for the sensory tactile and visual deprivations of the home experience compared to the concert experience.